According to SMMT, the Welsh new car market was in line with the UK overall with a 9% increase on 2013 to 90,982 registrations. The Ford Fiesta is the best-seller once again with an improved 9.1% share thanks to sales up 12%, ahead of the Ford Focus (-13%), Vauxhall Corsa (+7%) and Astra (-20%) like in 2013. 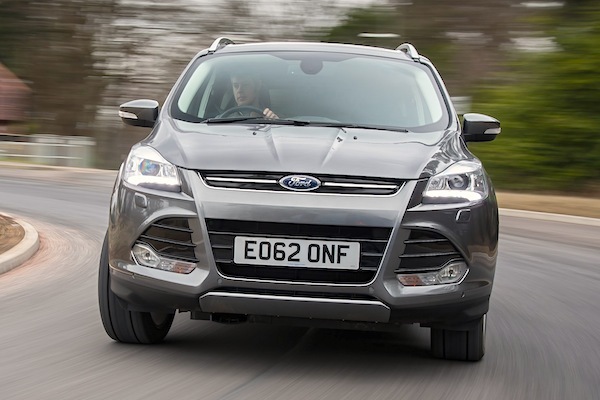 The big novelty in the Top 10 is the Ford Kuga leaping up directly to 5th place with 1,862 units sold for an excellent 2.1% market share, making Wales the Ford SUV’s best-performing UK nation by far in 2014. The Fiat 500 (#8) and Vauxhall Mokka (#10) also make their first appearance inside the Welsh Top 10. Full Year 2014 Top 10 models Ranking Table vs. Full Year 2013 figures below.